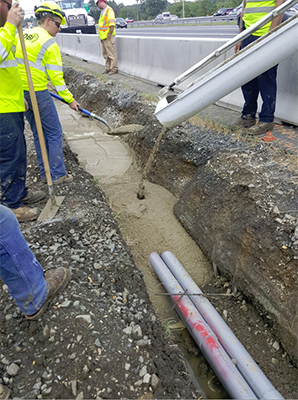 DMV Concrete Flowable Fill, Fairfax Va | We offer flowable fill as a concrete alternative for customers in Washington DC, Fairfax Va, Arlington Va, Alexandria Va and the surrounding area. Flowable Fill can lower your cost because it flows into place and settles on its own. It reduces the cost of manpower and equipment. While traditional compacted fill requires two laborers for placement and two laborers for compaction, flowable fill requires only one laborer for placement and no compaction. Using flowable fill also eliminates the need for conventional backfilling equipment such as compactors and backhoes. Flowable fill is easily conveyed by pump, chutes or buckets. It has controllable set times and allows the job to be completed faster. It eliminates the site crowding that comes with storing backfill materials on-site. Before a concrete overlay (called whitetopping) is poured, cracks in the existing asphalt should be filled with flowable fill that easily flows into cracks and crevices. This is an inexpensive way to avoid mirror cracking, which occurs when cracks form in the whitetopping in the same places where there are cracks in the asphalt. Call DMV Concrete for your flowable fill needs on your next project. We offer this option for our customers in the metro area including: Washington DC, Fairfax Va, Arlington Va, Alexandria Va and the surrounding areas, including Maryland suburbs around the beltway.